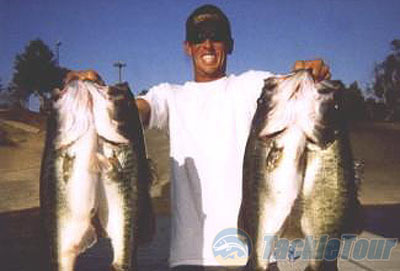 Introduction: Recently I caught up with Evergreen Pro Staffer and Southern California big bait enthusiast Shaun Bailey. Known as a fisherman who wears many hats Shaun has guided on various bodies of water, had his hands in designing timeless baits for close friends, produced a fishing video that has garnered cult status, and captured over 40 tournament wins. Since moving to Lake Havasu a few short years ago he's amassed a collection of boats, podium finishes at the U.S. Open, and is currently fishing the FLW National Guard. Here's how things went down. Brock: Around what age did you start fishing and what species did you start fishing for? When I was 4 my dad and grandpa used to take me trout fishing at local lakes. Both of them made sure to take me regularly. I got pretty into it from spending summers in Big Bear and getting dropped off at the dam all day, to living on a 40 ft sport fishing boat with my dad in Ventura harbor. I also worked on a few sport fishing boats fishing for calicos, white seabass, halibut, barracuda and rockfish as a deckhand. Just love to fish for anything really. Brock: When did you make the transition over to bass fishing? Was there a specific moment in time when you started targeting trophy largemouth? I made the transition when I was 19, I was getting burnt out working as a deckhand and a friend took me to Westlake. A private lake that we caught tons of bass at. I then borrowed an aluminum boat with a trolling motor and borrowed an old A.C. plug from a neighbor and went up to Lake Casitas for the day. My first fish was over 8lbs. I was hooked right then, instantly I started fishing for trophy bass. I bought my own aluminum, every swimbait I could find, and I started chucking 5 days a week. I had no clue what a crankbait or a plastic worm were, all I cared about was that big bass that eats trout. Brock: I know some guys that came from the salt to fish for bass either brought over various tackle or techniques, how did fishing in the salt help you? Well growing up the ocean really gave me a feel for pelagic fishing. Also for sure it helped me with swimbait fishing. Fishing for calicos and halibut with swimbaits really helped me with confidence in deep swimbait presentations. 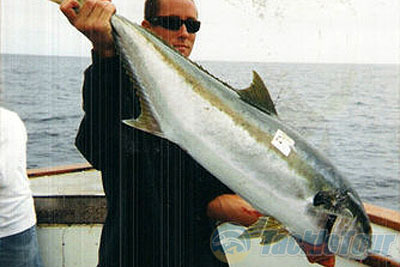 It also helps for staying on offshore spots by using land based references instead of or before GPS. Brock: Rumor has it you have caught double digit fish in the hundreds, when did you get your first trophy and how many have you caught to date? That rumor is true, it's definitely over 300. I stopped trophy hunting when I moved to Lake Havasu 4 years ago. All those fish were caught from the age of 19 to 29. I have added a few since I left, but have stopped keeping record since leaving Lake Casitas. That lake was a jewel, I used to go up there in the spring before work and drive by 9lber's just to find 10lb plus fish. I would catch 3 or 4 ten pounders a day and be at work by 10 am. I still might move back one day and start guiding again, you never know. I got my first trophy when I was 19. I was driving down the lake in my aluminum and a school of giants came up chasing trout right in front of me. I chucked an old school Dinosaur into a foamer and got my first 10lber. I was so pumped. I didn't have a livewell so I laid it on my deck and drove full speed to the dock through the 5 mph buoys into the marina. Randy came walking down with the scale and said "I knew you caught a big one by the way you drove in here". Brock: It must have been a sight to see so many big fish feeding....for those that don't know what is a "Dinosaur"? A Dinosaur is a 12" worm king, an old saltwater swimbait. Marv the old owner made a few giant ones for some freashwater guys and they took off. Brock: With the amount of dedication trophy hunting takes, what is the most days you've spent in a year targeting big fish and how important is time on the water? Wow that's a tough question, not sure I can pinpoint that. But I can honestly say for the last 15 years I have spent an average of 4 days a week on the water. More often than not its about 5 or 6 days a week. I can say without a doubt that time on the water is so important. I can't tell you how fast I learned to fish for bass, fishing 5 days a week. I feel weird if I fish less than that. I guess I really just enjoy being outside and on the water. If you want to be successful in this sport you need to fish A LOT! Ask my girlfriend haha. Brock" What is your favorite technique for catching big fish? Well if I had to pick I would probably say deadsticking a 10" plus floating trout bait over humps and points. The suspense just kills me, knowing they can see it and just waiting for one to lose its mind and swim 20 feet up and bust on it. Just love it. 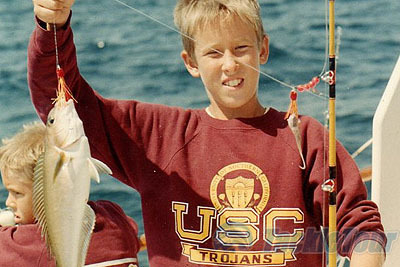 Brock: Growing up in Southern California you must have seen an array of old school big baits. 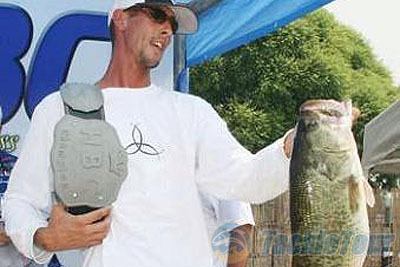 What were some of the earlier big baits used for big fish? Well the only things available were Castaic hard baits, Worm King dinosaurs, custom made baits like Buckertails. We used to convert musky baits for bass. Anything big we could find that looked like a fish. 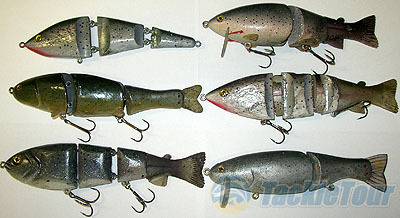 As soon as all the cool baits came out like the Castaic hard head soft body, Rago baits, Optimums the bite got tougher. Still good but tougher. Kinda funny watching those fish get wise to baits every year. They are a whole lot smarter than we give them credit for. 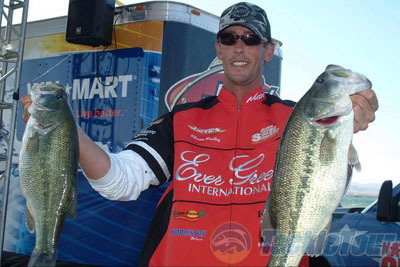 Shaun wins the belt at the "Heavyweight Bass Classic"
Brock: I've heard that you made quite a few well thought out baits some of which have cashed you some big checks notably the $10,000 at the Heavyweight Bass Classic. When did you start making baits and was there anyone that inspired you? Well Ken Huddleston definitely inspired me. I have been making baits for a long time. I started making baits when I was in my 20's. Just needed to show the fish something new constantly so I had to make them myself. The one that got me that HBC belt was just a simple modification. I made a 13" senko out of two 7" baits glued together. No big deal to make but you gotta have a lot of guts to fish it in a one fish tournament you traveled 14 hours to with zero practice! Btw I called that fish on that spot the night before the event to my brother. He didn't think much of it till I hit the dock at weigh in and said "I caught it off the spot and bait I told you I was gonna get her on". It was crazy, I just knew I was gonna hang a pig off it.